New York Giants general manager Dave Gettleman wants to convince the world that Eli Manning is as good as ever. Once the Giants made the decision to keep sticking with Eli Manning, after passing on quarterbacks in last year&apos;s draft, he had to defend his quarterback. “We went into last season with Eli and thought he had plenty left,” Gettleman said Thursday at his pre-draft press conference, according to the team&apos;s transcripts. 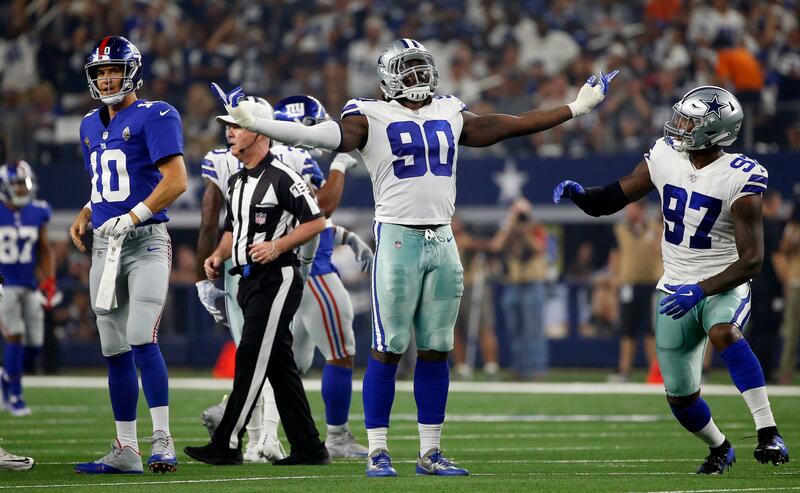 The Dallas Cowboys made DeMarcus Lawrence the highest-paid player in franchise history and gave him a pass-rushing partner on the other side in a trade for Robert Quinn. The Cowboys probably won&apos;t pick until the second round Friday after trading their first-round choice to Oakland for receiver Amari Cooper last season. &apos;&apos;We think it&apos;s probably the deepest position in this draft,&apos;&apos; said executive vice president of personnel Stephen Jones, Jerry&apos;s oldest son. How the Bears&apos; schedule stacks up against the rest of the NFC North originally appeared on nbcsportschicago.com We&apos;ve known who the Bears will play in the 2019 regular season since New Year&apos;s Eve 2018, and have known where they&apos;ll play those opponents for even longer. That always makes the NFL&apos;s schedule reveal sort of an odd phenomenon, especially because most of it gets leaked long before primetime shows air on NFL Network and ESPN. Additionally: Do we really know how good anyone is going to be in 2019, the Bears included? They host the Bills on Thanksgiving Day, Nov. 28, this season and then travel to Chicago the following Thursday, Dec. 5. They also traveled to Chicago on the Thursday after Thanksgiving in 2014. The game against the Bills marks the Cowboys&apos; 52nd Thanksgiving Day game. Although it hasn&apos;t been officially announced by the NFL, the Thanksgiving slate of games appears to be set: Bears at Lions in the early game, Bills at Cowboys in the mid-afternoon, and Saints at Falcons at night. Despite a previous report that the Dolphins would visit Dallas on Thanksgiving, it&apos;s Buffalo traveling to Dallas on CBS. That&apos;s a rematch of two past Super Bowls, and the NFL is emphasizing games with historical significance in its 100th season. Dallas Cowboys Executive VP Stephen Jones discusses the team&apos;s decision to trade a first-round pick for wide receiver Amari Cooper and if the team has any regrets. The Giants and Cowboys always seem to get together for a big-platform game early in the season. This year, via Ralph Vacchiano of SNY, it will happen again. New York at Dallas will ice off during Week One, in the 4:25 p.m. The Cowboys don&apos;t have a first-round pick in this year&apos;s draft as a result of the trade for wide receiver Amari Cooper and executive vice president Stephen Jones addressed the possibility of the team making a move to change that during a Tuesday radio interview. Dallas is currently set to make their first pick at No. 58 overall and Jones called it “real hard to think” that the Cowboys would be making any move that significantly changes that outlook. With six picks in this year&apos;s draft, any attempt to make a big jump up the board would likely require the Cowboys to dip into future stockpiles of selections and Jones&apos; comments suggest that&apos;s not going to happen.